Superoxide dismutase (SOD) is an antioxidant enzyme produced in our bodies to neutralize a specific oxygen-derived free radical called superoxide. 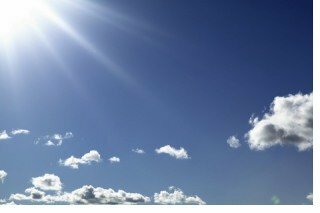 Oxygen that we breathe in is a source of life, but at the same time it can cause damage in the body by creating oxygen free radicals, molecules that become unstable by losing or gaining an electron and have to balance themselves by stealing electrons from other molecules, creating a chain reaction. These oxygen-derived free radicals, also known as reactive oxygen species (ROS), indiscriminately attack vital molecules, such as proteins, carbohydrates, and fats, which are a part of every single cell in our bodies, both inside and outside the cells, changing their function and impairing the normal course of metabolism in cells. ROS are also capable of damaging DNA. When enough cells get affected this way, disease sets in. Interestingly, ROS also have a function in the body – low concentrations of these free radicals perform a regulatory function in cellular homeostasis, the delicate balance of oxidant/antioxidant activity. ROS are necessary to activate the pathways that upregulate the activity of various antioxidant enzymes, including those of the glutathione system. In healthy people any damage from ROS is successfully counteracted with sufficient antioxidants that are either produced in the body or consumed with food – cells have developed these complex ways of controlling ROS but they are never completely eliminated. If this balance is tipped in favor of free radicals, oxidative stress occurs. Among the free radicals, superoxide (an oxygen molecule with an extra electron) is the most dangerous with a potential for much damage. This is because each superoxide molecule requires not one but three electrons to rebalance itself, and it does so more rapidly than regular free radicals that miss an electron rather than gain an extra one. Another danger that superoxide poses is that it is a precursor of all other ROS, particularly hydrogen peroxide and hydroxyl radical. Superoxide also has the ability to quickly combine with nitric oxide and form peroxynitrite, another powerful oxidant that causes such cellular damage that it leads to cell death. Some researchers even speculate that the danger of superoxide is not in itself, but in the many other free radical compounds it so readily converts to. 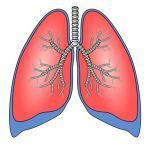 In addition to the simple act of breathing, the source of superoxide is our own immune system. Phagocytes (type of immune cells that ingest harmful foreign particles, bacteria and cell debris) such as neutrophils, macrophages or monocytes, produce superoxide in great quantities as a weapon against foreign invaders. Some bacteria produce superoxide as a defense mechanism against elimination. Another source of superoxide is the energy production in the cells. Mitochondria, the tiny engines inside our cells, use oxygen and the absorbed nutrients to produce energy – this energy is what makes our cells and tissues work, and what’s behind our every muscle movement, from blinking to running. Superoxide molecules are a by-product of this constant cellular energy production. 1%-3% of all oxygen consumed by our bodies is transformed into superoxide. And it is estimated that we produce around 3 tons of superoxides over our lifetime. But no matter the source of superoxides, the good news is that all our cells produce superoxide dismutase to neutralize these superoxide free radicals. A mutase is a type of enzyme that helps transform two molecules simultaneously in similar but opposite reactions by initiating the rearrangement of their atoms. SOD1 or CuZnSOD – intracellular SOD, requires copper (Cu) and zinc (Zn) to perform its function and protects the cell’s cytoplasm, the substances enclosed by the cell’s membrane where most of the cellular activity occurs. SOD2 or MnSOD – intracellular SOD, requires manganese (Mn) to perform its function and protects the cell’s mitochondria. SOD3 or EC-SOD– extracellular SOD, also requires copper and zinc and acts outside the cells. Availability of superoxide dismutase is crucial for maintaining redox balance in the body. For example, mice genetically engineered to lack the SOD2 gene, that regulates the production of MnSOD, die of overwhelming oxidative stress within 10 days of birth. (Dilated cardiomyopathy and neonatal lethality in mutant mice lacking manganese superoxide dismutase. Li Y, Huang TT et al. Nat Genet. 1995 Dec;11(4):376-81). Mice without the ability to produce CuZnSOD showed no apparent abnormalities up until early adulthood but had shorter lifespan and more than 70% of them developed liver cancers later in life. (CuZnSOD deficiency leads to persistent and widespread oxidative damage and hepatocarcinogenesis later in life. Elchuri S, Oberley TD etal. Oncogene. 2005 Jan 13;24(3):367-80). The antioxidant activity of superoxide dismutase is closely connected with glutathione and its enzymes. Animal and human studies that register suboptimal SOD levels also register low glutathione peroxidase levels. Substances that deplete glutathione are the same ones that create superoxides and deplete SOD levels. Low SOD levels are characteristic of the same debilitating diseases and health conditions where low glutathione is implicated: HIV/AIDS, asthma, burns, all cancers, cataracts, chronic fatigue syndrome, diabetes, autoimmune disorders, diseases of liver, kidneys, lungs, heart and digestive system, fibromyalgia, multiple sclerosis, Parkinson’s, Alzheimer’s, ALS (Lou Gehrig’s), neuropathies, physical traumas, skin disorders, seizures, tumors, chronic inflammation, recurring infections, susceptibility to colds and flus. 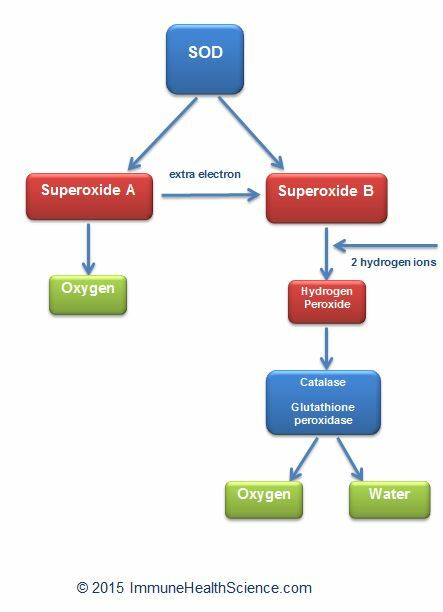 Since superoxide free radicals can impair normal cellular activity, they can disrupt the manufacture of glutathione molecules. Thus, SOD ensures the safety of glutathione formation. If left unchecked, superoxide radicals break DNA strands, and since DNA repair is one of glutathione’s many functions, more glutathione has to be used for repairs. Chronic overproduction of superoxides is linked to inflammation which is known to deplete glutathione levels. Adequate SOD levels effectively neutralize superoxides and undoubtedly contribute to maintaining optimal glutathione levels. The relationship of SOD and glutathione works both ways - therapies aimed at optimizing glutathione and, consequently, the body’s total antioxidant status, also improve the levels of SOD, because with the overall reduction of superoxides less SOD is used by the body. The production of SOD decreases with age, just like the production of our other endogenous (produced by the body) antioxidants, such as catalase, glutathione, and alpha lipoic acid. Deficiencies in zinc (also a GSH cofactor), copper and manganese can impair the production of superoxide dismutase and lead to oxidative stress and cellular damage. Sufficient intake of these three minerals is very important in helping the body produce more SOD. Amino acid cysteine is required for superoxide dismutase’s structure. This amino acid is also a crucial glutathione precursor and a rate-limiting factor in its production. Undenatured whey proteins are the best source of bioavailable bonded cysteine that has the ability to enter cells. As I mentioned above, raising glutathione levels will improve SOD levels as well. Wolfberry (goji) juice rich in the active compounds, Lycium barbarum polysaccharides (LBP), has been found to increase SOD levels by 8.4% in healthy adults aged 55-72 in a 30-day randomized, double-blind, placebo-controlled study (Lycium barbarum (goji) juice improves in vivo antioxidant biomarkers in serum of healthy adults. Amagase H, Sun B, Borek C. Nutr Res. 2009 Jan; 29(1):19-25). In another placebo-controlled trial, also with patients with metabolic syndrome, curcuminoid-piperine combination was found to considerably improve serum SOD activities. 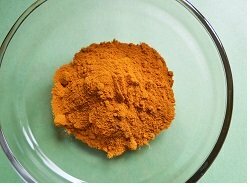 Curcuminoids which are the derivatives of curcumin, the active compound of the spice turmeric, were administered at a daily dose of 1 g for 8 weeks, and were co-supplemented with piperine (active compound in black pepper) at 10 mg/day in order to boost oral bioavailability of curcuminoids. (Antioxidant and anti-inflammatory effects of curcuminoid-piperine combination in subjects with metabolic syndrome: A randomized controlled trial and an updated meta-analysis. Panahi Y, Hosseini MS et al. Clin Nutr. 2015 Jan 7. pii: S0261-5614(15)00002-3). Daily yoga exercises over the period of 3 months raised serum SOD levels 31.35% in elderly subjects with hypertension. Interestingly, blood glutathione levels increased significantly too, by 20.45%. The second group of patients, who walked daily for 1 hour for the same period of 3 months, did not see any changes in SOD or GSH levels. (Effect of yoga on oxidative stress in elderly with grade-I hypertension: a randomized controlled study. Patil SG, Dhanakshirur GB et al. J Clin Diagn Res. 2014 Jul;8(7):BC04-7). Scientists have discovered that some plants produce SOD naturally as a means of defense: sprouts of wheat, corn and soy, spinach and cantaloupe melons. However, the bioavailability of ingested SOD is very low as most of it gets destroyed by stomach acids and does not reach the bloodstream. (Fate of superoxide dismutase in mice following oral route of administration. Giri SN, Misra HP. Med Biol. 1984;62(5):285-9). A novel formulation of melon-derived SOD bonded with a biopolymer isolated from wheat, known as gliadin, has been shown to possess much higher bioavailability - such a bond allows SOD to bypass the stomach acids and digestive enzymes, and enter the bloodstream intact. Although the majority of the studies are on rodents, there are a few promising human trials. One human trial investigated the effects of SOD-gliadin supplementation on physical exercise in 19 volunteer professional athletes at a dose of 500 mg/day or placebo for 6 weeks. Blood samples were examined before and after a 2 km rowing exercise. The supplemental group (10 athletes) showed increased SOD activity and reduced levels of C-reactive proteins, a marker of oxidative stress suggesting that SOD-gliadin exerted anti-inflammatory action. However, supplementation offered no protection from oxidative damage induced by exhaustive exercise. (Effects of oral supplementation with plant superoxide dismutase extract on selected redox parameters and an inflammatory marker in a 2,000-m rowing-ergometer test. Skarpanska-Stejnborn A et al. Int J Sport Nutr Exerc Metab. 2011 Apr;21(2):124-34). In another human trial 20 healthy participants were subjected to 100% oxygen therapy for 60 minutes to determine the effects of SOD-gliadin supplementation on oxidative damage which is usually the result of this therapy. The daily dose was 1,000 U SOD or placebo for 2 weeks prior to oxygen therapy. The result showed that the supplemented group had significantly lower levels of DNA breaks and a lower concentration of plasma markers of oxidative stress. Plasma SOD activity, however, remained unchanged – it appears that the protective effect of supplementation was due to the prevention of the drop in SOD levels which would have otherwise resulted in oxidative damage. (Influence of an orally effective SOD on hyperbaric oxygen-related cell damage. Muth CM et al. Free Radic Res. 2004 Sep;38(9):927-32). While supplementation with SOD-gliadin may be beneficial for maintaining extracellular SOD levels under certain conditions, SOD cannot enter cells and affect intracellular levels because of its large molecular size. Dr. Romao, who summarized the recent research with oral SOD-gliadin (see #4 in Sources below), concludes that supplemental SOD-gliadin “may represent a meaningful quality-of-life improvement”, but emphasizes that “most studies on the SOD-gliadin formulation indicate that supplementation presents auxiliary effects rather than curative properties” and recommends more large-scale experimental human trials to be carried out. 1. Book “SOD-gliadin” by Carl Germano, RD, CNS, LDN. 2. Book “Health and Nutrition Secrets” by Dr. Russell Blaylock. 3. Book “Glutathione. The Altimate Antioxidant” by Dr. Alan Pressman. 4. Review “Therapeutic value of oral supplementation with melon superoxide dismutase and wheat gliadin combination”. Susana Romao, PhD. Nutrition. 2015 Mar; 31(3):430-6. 5. Review “A mitochondrial superoxide theory for oxidative stress diseases and aging”. Indo HP, Yen HC, Nakanishi I, Matsumoto K et al. J Clin Biochem Nutr. 2015 Jan;56(1):1-7. 6. Report “Superoxide Dismutase. Boosting the Body’s Primary Antioxidant Defense” by Dale Kiefer. 7. Supplementation with gliadin-combined plant superoxide dismutase extract promotes antioxidant defenses and protects against oxidative stress. Vouldoukis I, Conti M, Krauss P et al. Phytother Res. 2004 Dec;18(12):957-62. 8. Activities of red blood cell anti-oxidative enzymes (SOD, GPx) and total anti-oxidative capacity of serum (TAS) in men with coronary atherosclerosis and in healthy pilots. Zawadzka-Bartczak E. Med Sci Monit. 2005 Sep;11(9):CR440-4. 9. Superoxide dismutase administration, a potential therapy against oxidative stress related diseases: several routes of supplementation and proposal of an original mechanism of action. Carillon J, Rouanet JM et al. Pharm Res. 2013 Nov; 30(11):2718-28.